"This is a recipe my husband got from one of his co-workers. He absolutely loves this!" Combine flour, salt, and pepper in a shallow dish; add beef pieces. Toss to coat each piece evenly. Reserve remaining flour mixture for later use. Heat oil in a large non-stick skillet; cook and stir coated beef, working in batches, until browned on all sides, about 10 minutes per batch. Transfer cooked beef to a slow cooker. Cook and stir onion in the same skillet used for beef until golden, about 5 minutes. Add beer and garlic; bring to a boil for 1 minute. Scrape browned bits of food from bottom of the pan with a wooden spoon. Pour onion mixture into the slow cooker. Mix beef broth, parsley, thyme, and bay leaves into beef mixture in slow cooker. Cook on Low until beef is almost tender, 2 1/2 to 3 hours. Sprinkle in the reserved flour mixture; stir well. Add potatoes and carrots. Cook on High until potatoes are tender, about 1 hour. Arrange puff pastry on baking sheets; pierce each piece several times with a fork. Bake in the preheated oven until golden and crispy, about 10 minutes. 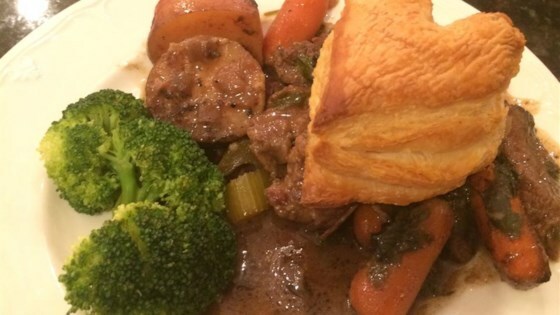 Ladle stew into individual dishes; top each with a pastry square. Made it exactly as written. It's very easy, and the meat was tender. The rest was a little bland. Next time I'll tweak it with some spices. This was absolutely delicious and reheated beautifully. Just be careful, this is a HUGE recipe. I had to use less of almost everything so that I could fit it in my slow cooker. Very disappointed. Followed the recipe exactly as instructed and the vegetables were extremely hard and undercooked. Needs much more time in the crock pot.